It’s that time of year again! The Tumbleweed Tiny House Workshop will be happening in Boston in a few short weeks and I’m excited to say that I’ll be guest speaking at this SOLD OUT (!) workshop, talking about my experiences building a Tumbleweed house this fall and sharing my expertise in small-scale (tiny) off-grid systems for your tiny house. The workshop is Feb. 9-10, and you can still put your name on the wait list! Deek Diedricksen is hosting this one, and he’s a wonderful teacher and makes the workshop really fun. So if you’re already signed up, I’ll see you there! Bring your tiny house questions and get ready to be inspired. Here’s a photo from last year’s Tumbleweed workshop, when we visited the first ever built Tumbleweed house that Jay lived in for years. I can’t believe it’s fall, for real it’s fall! In Vermont, the leaves went from barely changed last week when I was there building a tiny house, to almost all fallen this past weekend when I was at Yestermorrow taking my final Sustainable Design/Build Certificate course, Super Insulation for Zero Energy Buildings. Got me thinking about building a super insulated tiny house. Tiny houses already use so little energy to heat (or cool, depending on where you are), but super insulation would be a great option for a tiny house that was on a foundation. Why spend money on heating fuel if you didn’t have to by designing your home this way? Very interesting stuff. 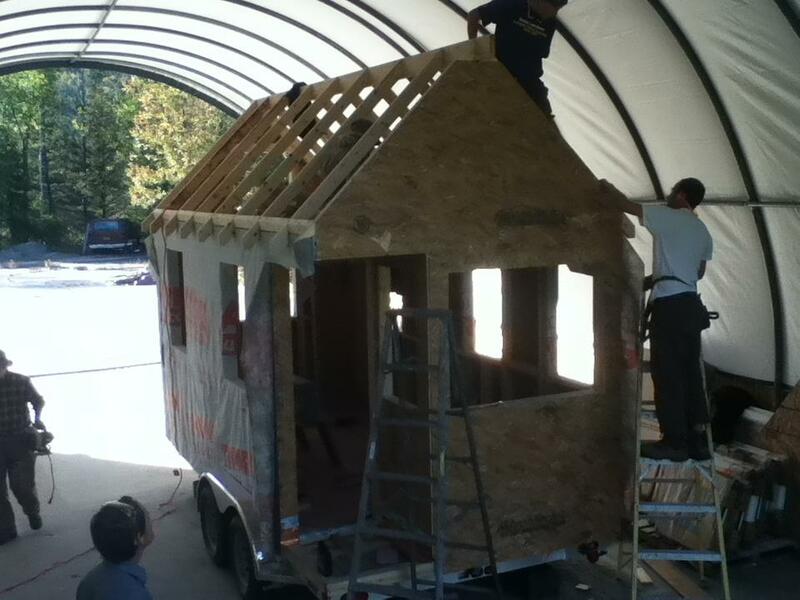 So here are a few more photos of the tiny house build at Yestermorrow from last week. I’m not going to go into great detail about how we built the house, because I still have so much to catch up on writing about the COMET’s progress and other things, but please ask questions if you have some burning things you want to know! Now I can officially say I’ve built a tiny house on wheels. You can see the 4 x 4 supports that hold the house together and form the framing of the loft floor. TerraNova, the lovely lady from Boston that I met at the workshop, and hopefully a longtime tiny house buddy, is problem solving. Here you can really see the loft framing and spacing of the 4 x 4s. The rafters are up, and the gable ends are on. While people were working on the roof, I was on my back underneath the trailer, under both axles (yes, I was terrified) screwing the house into the trailer. But I’m used to rolling around under the chassis of a trailer, so I volunteered! 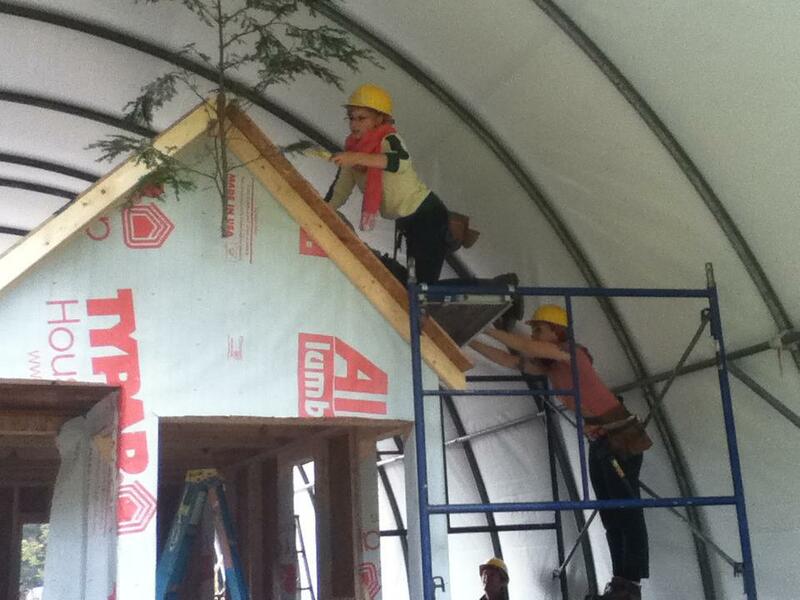 That’s me, in the pink scarf, scared to death nailing in the roof while Terra holds me up on the scaffolding. Thanks Terra! We put on as much siding as we could by the end of the last day. We had installed all windows, all trim, decking on the porch, and a few other details. I think much of the exterior trim/siding was salvaged from Detroit. What an awesome team! We did it! By the end of the day, we were all ready to eat some pizza baked in the earth-oven next to the Quonset hut. Thanks Timothy for all of these pictures! 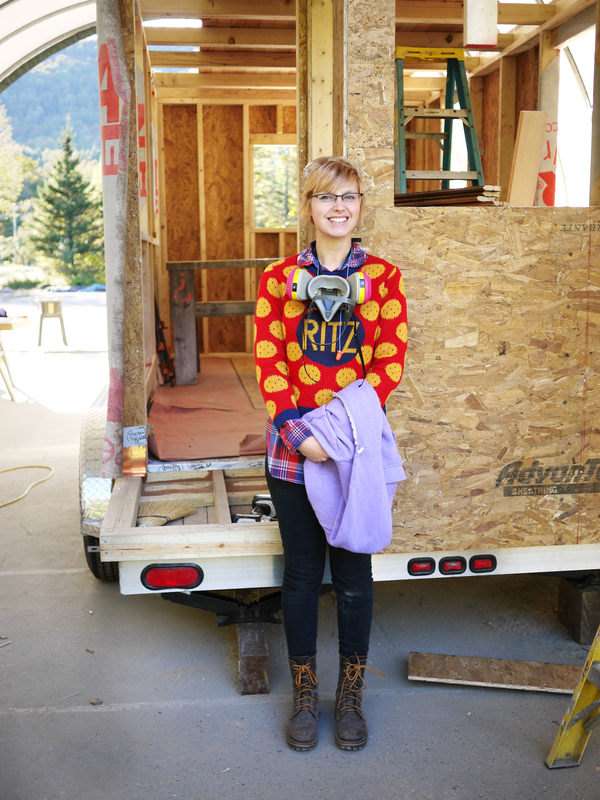 Me with the tiny house, in my famous Ritz crackers sweater. Everyone called me “Ritz” for two weeks. Photo courtesy of Swan Moon. And there you have it! 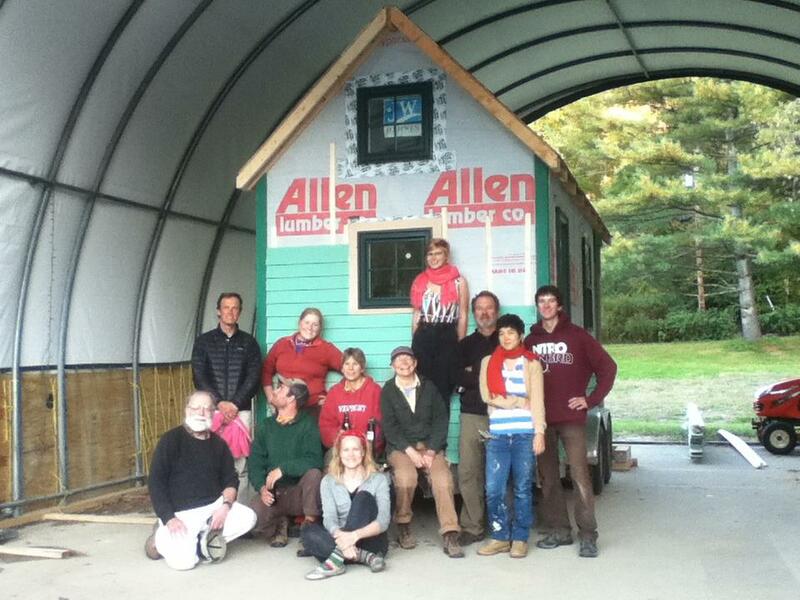 10 people built a tiny house in 10 days. After the class, the instructors finished up the siding and now the house is set to go back to Detroit to it’s new owner. I’m doing a segment for spaces.tv this weekend, which I am super excited about and SUPER busy getting ready for. The COMET will look pretty rad by then, and then I think I’ll do some sort of unveiling (it’s not done, and won’t be till November 2 – Tiny House Workshop with Deek in Boston – but it’s looking pretty good!). Thanks to everyone to continued support and thank you for reading along! I’m really going to do my best in the next two weeks to keep you updated on this tiny house build. It’s a crazy intense workshop – building/construction from 9 am – 5 pm, then class and studio time designing our own tiny houses from 5- whenever you fall asleep at your desk! 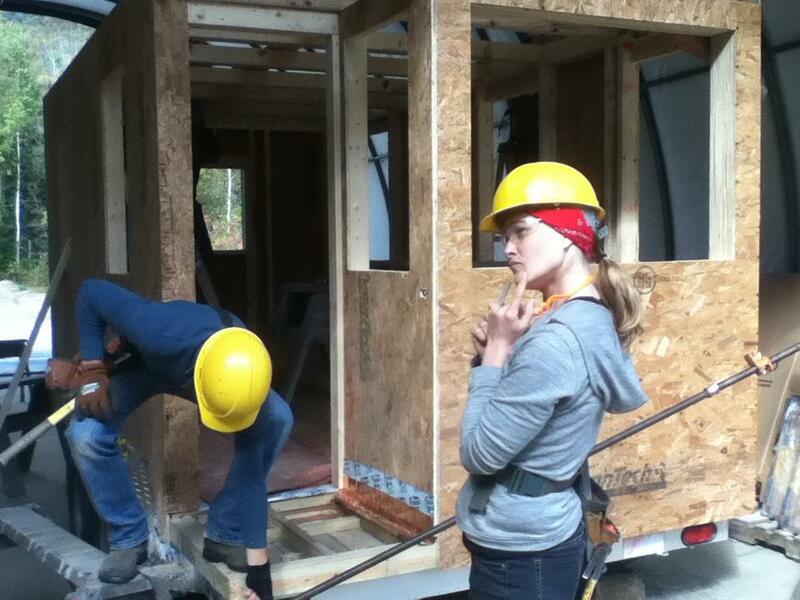 But I will do my best to update, because it’s an awesome process we’re going through with this tiny house. Working as a group is always an interesting experience! 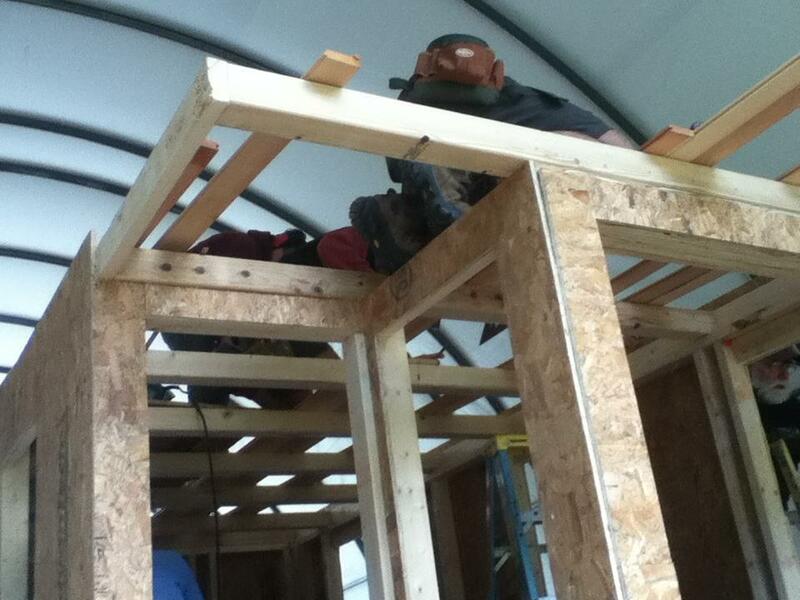 Tumbleweed Tiny House Worskhop Re-cap and Progress! I’ve been away from the blog for a few days in favor of getting in some full days of work out in the COMET. I will spare you some of the details (I removed the black water tank. I then had to remove and clean the wood/subfloor that the black water tank sat on. Not pleasant!) so you don’t lose your breakfast, but I will say that I found something HILARIOUS hidden in the walls of the camper under the toilet. My COMET definitely has a history! I’ll post a picture of it later, because it’s too funny (and somewhat lewd) to describe at the moment! 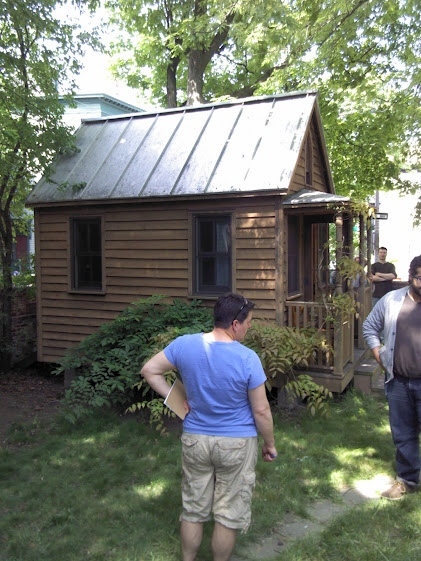 Anyway, what I really want to talk about is the Tumbleweed Tiny House workshop that I spoke at and attended in Boston over the weekend. I was getting over a fever/cold this weekend (I hate summer colds!) but had a GREAT time at the workshop. 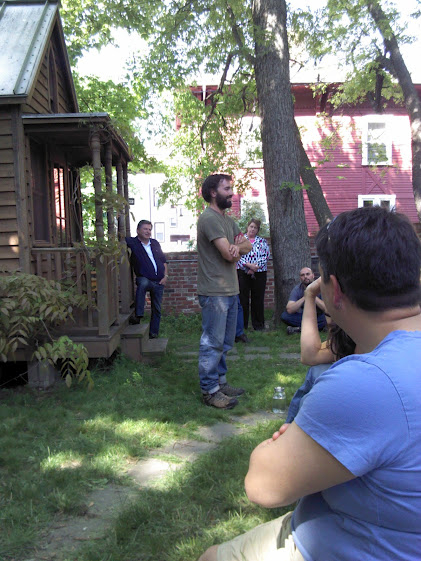 The main part of the workshop was taught by Derek Diedricksen, tiny house and recycled materials guru. I gave a presentation about how the design and technology of the camper industry can be interpreted into tiny houses, and how you can re-use vintage camper appliances and parts in a tiny house to save money. Mostly, though, I talked about solar power and how to set up an entirely DC Photovoltaic system, which saves you money and is more efficient. People seemed to really enjoy the presentation, and there were lots of questions. For me, it was like accomplishing a life goal, a personal achievement! I can’t believe that after only a few months of working on The COMET I was already speaking at a tiny house workshop – and a Tumbleweed one none the less! I was psyched! The workshop was really great. It’s 2 days and it was largely classroom-based. We talked a lot about trailers and what special construction details need to go into a tiny house that is on wheels and will occasionally be moving. There are a lot more structural considerations. Being a builder, not all of the information was new to me, but I do think it’s a worthwhile workshop for someone wanting to know how the tiny house building works. I did particularly like talking about systems for your tiny house and hearing from a presenter, Doug, who had built a Tumbleweed Fencl out of SIPs (when I build a real tiny house – in the future when I’m a real adult – I’m definitely using SIPs!). At the Epu location we all sat around a gorgeous pond on a stone wall and listened to a few more speakers. Sage Radachowsky, who lives in his home-built gypsy wagon in a backyard in Boston, spoke about his build process and using found materials. He was wonderful to listen to, and has been going beyond the tiny house and keeping a garden, chickens, and bees. Check out the TIny Yellow House video about Sage’s gypsy wagon home here. I have plans to do a video interview with Sage in his home, and talk about why we choose to live tiny and other big “tiny” questions. I have lots to ask him! Sage Radachowsky talks about his life in a tiny gypsy wagon that he built. We then heard from John Hanson Mitchell, author of “Living at The End of Time“. He built and lived in a tiny house in the 80’s, and wrote the book about his experience. It was very interesting to hear his story or living in his tiny house without modern amenities, while less than a mile away a giant computer factory was being built. The best part of these workshops is the mingling and “networking”. “Networking” makes it sound like a business meeting, but I felt like a met a lot of nice people with similar interests that I would like to keep in touch with. I loved hearing about other people’s plans, and it was nice to be able to offer some first-hand advice. I can’t wait for Tiny House Summer Camp in July (go to relaxshacks.com to find out more and register!). The Tumbleweed workshop was totally life affirming! Well, it’s back out to the COMET for another day of work. There’s a lot I have to get done before July 6th (Tiny house Summer Camp), and I leave on Sunday to go to Yestermorrow School for 3+ weeks for Core. I’ll check in later! 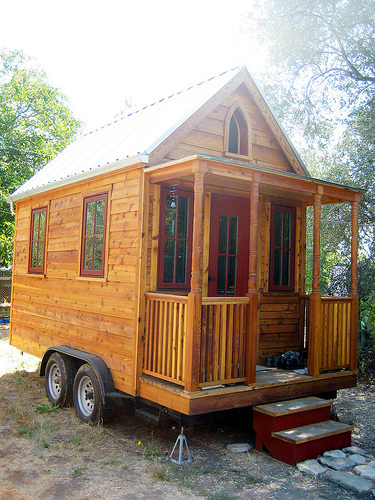 Tumbleweed Tiny House Workshop is right around the corner! 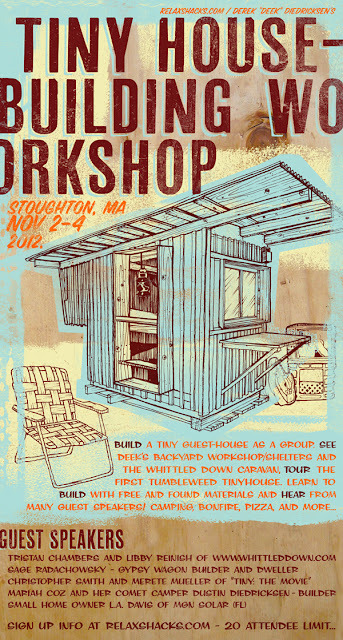 The highly anticipated Tumbleweed Tiny House Workshop in Boston, MA is coming up this weekend. I’ll be speaking at the workshop and doing a little presentation. I’m honored and very excited! (Personal achievement alert: When I applied for field study at the beginning of this semester, I wrote down all of the workshops that I was hoping to attend as a student. Now I get to tell my advisors that I actually guest spoke at those workshops!). I’m going to be speaking about campers as tiny houses, how to save money in your tiny house, solar powered tiny houses, and some other off-grid and eco-friendly systems. I’m excited about all of the other speakers and our special tour of the very FIRST Tumbleweed tiny house! The workshop is led by Derek Diedricksen of relaxshacks.com. You can go to the Tumbleweed website to sign up for the workshop, if you haven’t already. If you are reading this and are planning on attending the workshop, let me know in the comments! See you all on Saturday in Boston! Also, if you’re a tiny house nut like me (which you probably are, and if you’re not you will be soon!) sign up for Derek Diedricksen’s TINY HOUSE SUMMER CAMP! Go over to relaxshacks.com to sign up. It’s a 4 days weekend in July of tiny house fun!! I’ll be bringing the COMET to that one, so you can see her in all her mid-construction glory! 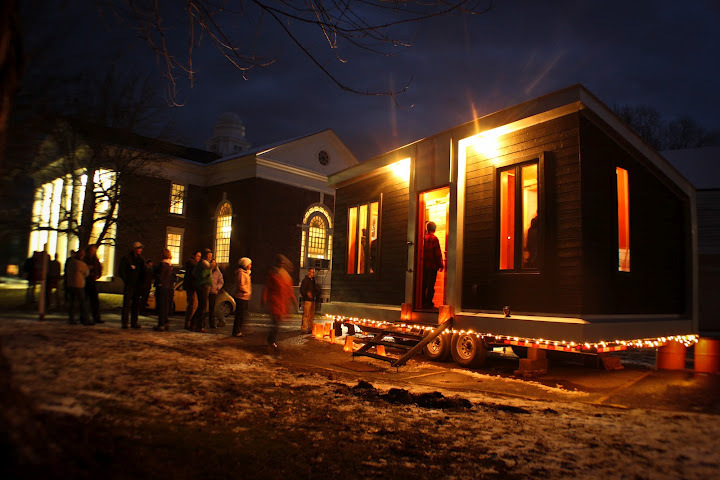 The COMET and I will be at the Tumbleweed Tiny House Workshop in Boston next Month! I’m very excited to announce that I will be speaking at the Tumbleweed Tiny House Design/Build workshop with Derek “Deek” Diedricksen. 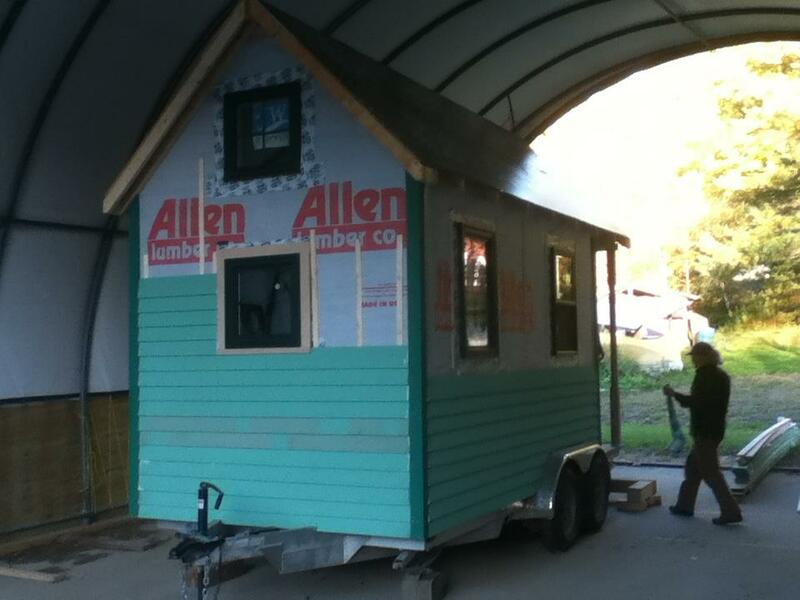 The Tumbleweed Tiny House Company’s workshop is in Boston, MA and is 2 days, May 19th and 20th. I will have The COMET with me (someway, somehow, I will be towing – and parking it – around Boston!) and will be talking about the project, vintage campers as Tiny Houses, solar electricity in your tiny house or converted camper, and green + recycled building materials. It’s going to be an awesome weekend. There will be some other guests announced soon as well. 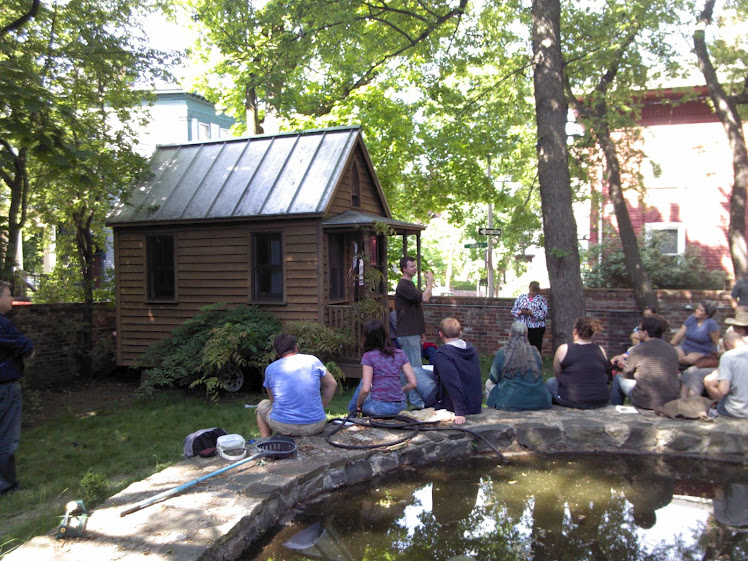 Go to the Tumbleweed Tiny House website, http://www.tumbleweedhouses.com/workshops/boston/, and sign up for the weekend workshop soon! Also, go to relaxshacks.com and sign up for the other workshop that The COMET and I will be at – Tiny House Summer Camp weekend in Vermont, July 6-9. Can’t wait to show you all The COMET’s progress up close and personal, and meet some of you in person. If you are planning on attending either of the workshops this summer, let me know in the comments! Yestermorrow Design/Build School – first workshop this week! I realized that I hadn’t written a post about the Yestermorrow Design/Build School in Vermont, and that I should introduce you all to the place since I have my first class there this coming Sunday. 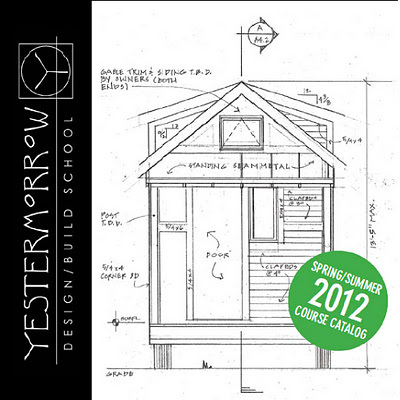 Yestermorrow School is a design/build school that focuses on hands-on teaching and sustainable building practices. They offer workshops that range from 2 days to 4 weeks (and they have a sustainable building semester program with UMass Amherst). Topics range from Green building materials, woodworking, and tiny house building workshops, to architectural design and drawing courses and stained glass making workshops. I found out about them last year and when I read their “Philosophy” statement I was SO HAPPY to find a place that shared my values exactly. All last semester I had been talking about closing the gap between designers and builders, and wasn’t really getting any support in doing that. So I left my college for some time to attend Yestermorrow for the next year, through their Sustainable Design/Build Certificate program. Basically with the certificate program (and they offer certificates in other subjects too) you choose a handful of week-long, 3-week long, and weekend workshops from a long list of amazing classes. I chose the certificate over the semester program because of the flexibility and that way I could work on The COMET at the same time. I’ve heard the workshops are really intense and totally awesome, and that a 3 week workshop feels like an entire semester. I’m about to find out! “Yestermorrow’s courses are specifically designed to demystify the designing and building processes using hands-on, experiential learning to teach students the art and wisdom of good design and the skill and savvy of enduring craftsmanship as a single, integrated process. There you have it. I was in love! Anyway, this coming Sunday I go up to VT for my first workshop – a 5-day intensive called “Solar Electric Design and Installation”. Just in time, too, because I just bought 3 solar panels! I specifically chose workshops that would help me with the skills associated with designing/building/making the COMET. Once I take this workshop, I’ll be able to install my own photovoltaic system, and show you all how I did it step by step! I encourage you to check out the Yestermorrow website and browse through their courses to get an idea of how awesome the place is. When you attend a class there, you can either stay in the main building, stay in a cabin, or just camp out. I’m really excited! Hopefully at some point I’ll be able to stay in the COMET when I’m up there! Also, on the topic of workshops, I just signed up for the recently announced Tumbleweed Tiny House building workshop in Boston on May 19th and 20th, with Jay Schafer and fellow Massachusetts tiny house guy Deek Diedricksen. I’m really looking forward to it. Personally, I think the Tumbleweed houses are a little too traditional for my style (what can I say – I like recycling junk and using used materials! ), but I’m looking forward to building one! Is anyone else planning on going to the Boston Tumbleweed workshop? You can support The COMET project and education in sustainability by donating here! 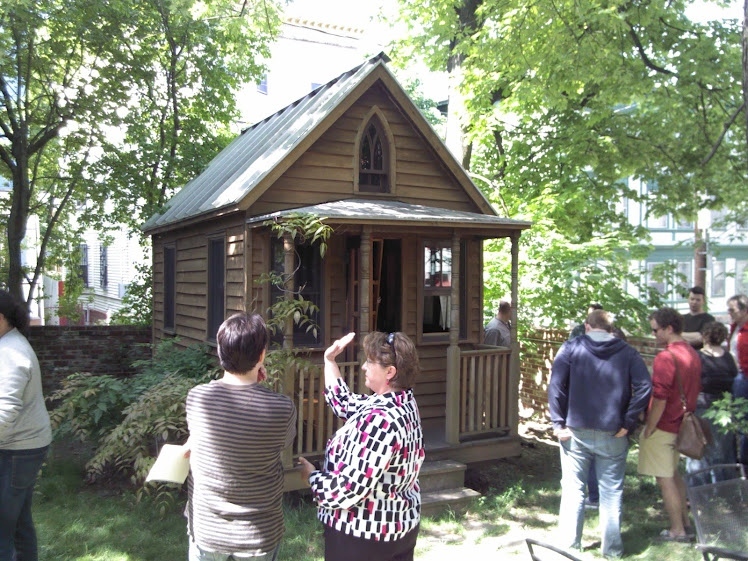 Tiny House in your backyard? Help a friend in need! Where have I been? What’s going on? Next event on the calendar is…. Tiny house/small space design course at Yestermorrow. I'll be doing a guest lecture this year.